Sorry about the delays between posts, school has been picking up again and some other stuff keeps coming up. I am putting my stabilization system on the back burner at the moment because for it to progress I'm going to need access to 3D printers and Autodesk Inventor. I will be going to TechShop DC during Christmas break to continue work, if you're in the area stop by and say hello! (Contact me @ascii211 prior to stopping by). 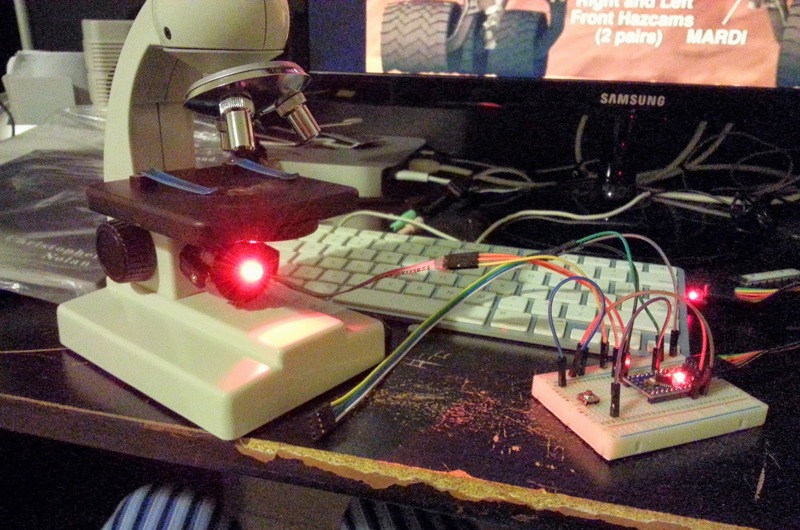 Currently I'm working on upgrading my little sister's cheap microscope to ditch the horrible dim and yellow incandescent bulb it shipped with. Now it is currently powered by a cheap pro mini clone (thanks China!) 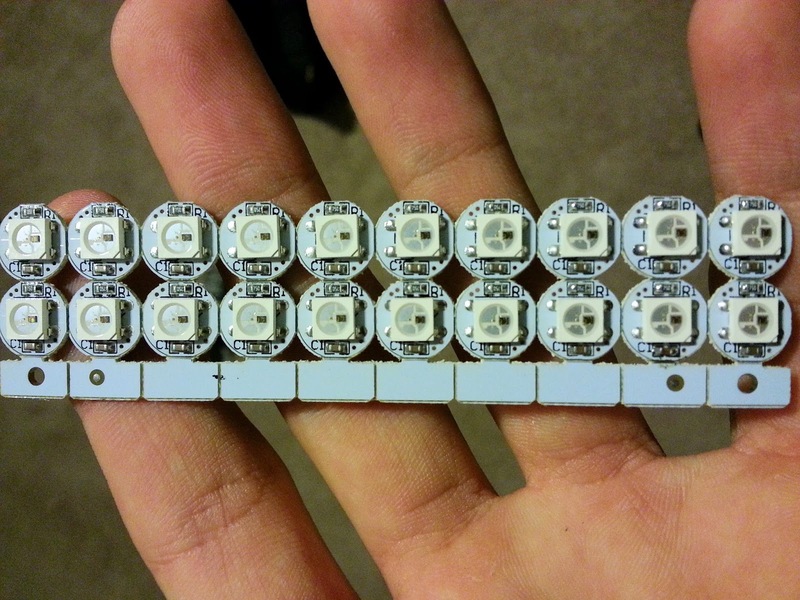 and a single neopixel on a breakout board. It is able to cycle through any color you choose at the push of a button (still needs to be modded into the frame of the microscope, in addition to a power port to eliminate the batteries and a momentary SPST switch to change the colors). Build details and code will be posted here and on Instructables for those interested in replicating this project. 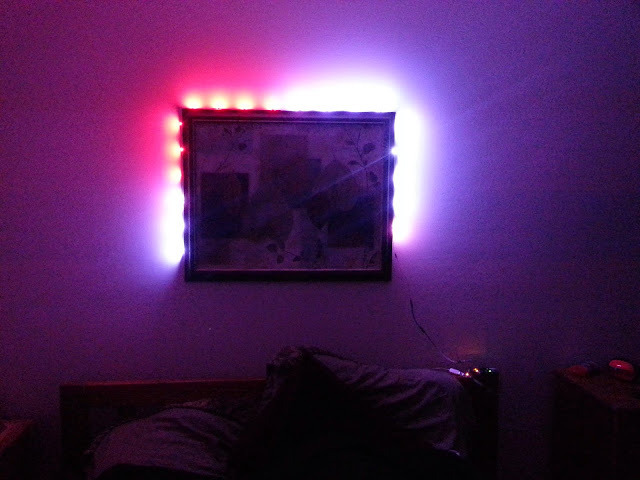 Second project is Neopixel christmas lights. 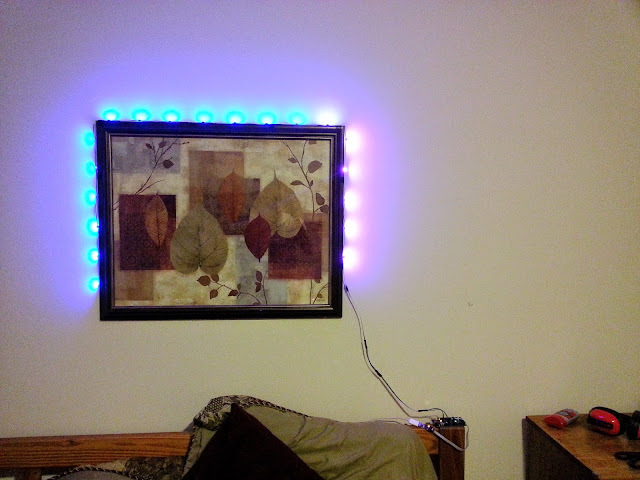 Most programmable christmas lights are expensive and set to their factory length so I thought it was time to DIY up a set of them in true maker style. After a quick trip into the wonderland of eBay a set of 20 WS2812B individual pixels (grand total of $4) was heading my way, Once they arrived I chained them together by using some scrapped ribbon cable from old computers, connected it to my clone Mega, flashed it with the program and it was done! Code was borrowed from here and works amazingly!